Why Can We Face the Future with Confidence? America’s presidential campaign and election unsettled millions of people. No one can predict what might happen with the economy and global relationships in the weeks and months ahead. Even the political experts admit they’re clueless. One can only watch. And pray. The future is anything but secure on a worldwide scale. Truth be told, it’s not certain on home fronts, either. A week ago today, one of my friends and her husband enjoyed their morning coffee while watching Canada’s national Remembrance Day celebrations on television. By that afternoon, he lay in ICU in an induced coma after suffering a massive heart attack. He passed away on Tuesday. Losing this friend has been a surreal experience. I’ve been mentally processing it all week, realizing how quickly life can flip. One minute all is well, and then everything changes in a heartbeat, sometimes literally. So, how can we face the future with confidence? By knowing what God says about it and by taking Him at His word. Here’s a verse that’s helped me in recent days. God’s promise to remain faithful and present enables us to develop and maintain a fearless outlook. And get this—He says He will always be faithful, and He will always be present. That means we can always be fearless. No matter what comes our way, He will help us get through it. Of this we can be sure. Fill in the blank with whatever’s pertinent to your situation. Here are some suggested responses to which you might relate. Send me a friend request if you want to receive a notification when I go live. I hope to see you there! Psalm 116:15 Precious in the sight of the Lord is the death of his saints. That is from Scripture, but not always the best sounding consolation for people. Psalm 118:1 O give thanks unto the Lord; for he is good: because his mercy endureth for ever. We are still to give thanks to God. Even in our shock and maybe “fear” also, if we turn to Him………He is our consolation and help. Heb.13:5,6 “The Lord is my helper, I will not be afraid. 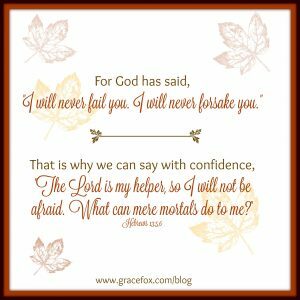 No, He will not leave us nor forsake us, and when we “are” afraid, we must try to look first to Him…..not to our feelings, our emotions, and how the evil one wants to “throw us off track”…….but to the LORD, the maker of Heaven and Earth. Our gentle Shepherd will “Make us lie down in green pastures, and He will restore our Soul (from Ps. 23) He will give us good grazing land, and fresh cool water to restore our souls. In return, we show compassion to the one who has just lost someone…..the one who is still here, with us. I love you, Grace. I love how you allow God to use you to minister to others in their time of need. I could never forget all you’ve done for me. Your care for me and action taken in ministering God’s goodness and love to me (with great info for me to study), has changed my life forever. Marge May God fill you with His Spirit today! Marge, thank you for all these wonderful Scriptures. God’s Word is alive, powerful, life-changing. So encouraging, yes?